By the early 2000s, the AIDS pandemic in Africa had taken its mortal toll, leaving millions of children orphaned and a continent on its knees. In the face of that overwhelming loss, families and communities were held together, in large part, due to the grandmothers of Africa who stepped in to care for those orphaned children, sometimes taking in as many as ten to fifteen in one household. Over the years, these indomitable forces established themselves as invaluable leaders, integral to the sustainability of Africa. Central to their communities, grandmothers have demonstrated profound displays of love, courage and emotional resilience, even while grieving the loss of their own adult children. Among their responsibilities, grandmothers put their grandchildren through school, create support groups to manage grief, deliver comfort through home-based care, provide education on HIV prevention and treatment and create local savings and loan groups. The story of these courageous and powerful grandmothers have now been documented in a new book by the Stephen Lewis Foundation’s Joanna Henry, photographer Alexis MacDonald and Ilana Landsberg-Lewis. 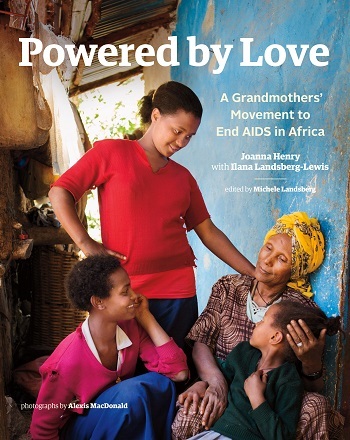 Powered by Love: A Grandmothers’ Movement to End AIDS in Africa brings readers to eight African countries and offers compelling interviews and photographs with hundreds of grandmothers (including Sarah Obama, Barack Obama’s grandmother) who have reclaimed hope and resurrected lives. Bringing to life the story of these dogged and ever-determined leaders, Powered by Love is the untold account of AIDS in Africa. And it’s an inspired glimpse into a social movement that has held hands, wiped tears, emboldened communities, provided hope and helped sustain a continent. The efforts and challenges faced by African grandmothers has been a focal point for Stephen Lewis Foundation for many years. In response to the crisis, the organization launched the Grandmothers to Grandmothers Campaign in 2006. The grassroots initiative was designed to engage and encourage Canadian grandmothers to support their respective grandmothers taking a leading role in Africa. 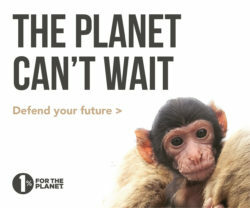 Over a decade later, the Campaign is a movement 10,000 strong that stretches around the globe. It raised over $27 million to support African grandmothers and their grassroots organizations working at the front lines of the AIDS pandemic. And they’re getting some extra help along the way. For example, the Foundation has been a long-time partner of Aeroplan’s Member Donation Program. The partnership began when the organization used Aeroplan Miles to bring grandmothers from Africa and Canada together for World Aids Day at Ryerson University in 2006. Out of that event, the Grandmothers to Grandmothers campaign was inaugurated, relying from day one on Aeroplan Miles to support their travel. In fact, this book was made possible by donated Aeroplan Miles that were used to travel for interviews and photography in Canada and Africa. Powered By Love, published by Goose Lane Editions is being marked by more than 40 different events throughout Canada, organized by Canadian grandmothers’ groups. Proceeds from these events and royalties from sales of Powered by Love will be directed to the Foundation to support organizations run by and for these African grandmothers who continue to raise children orphaned by AIDS. 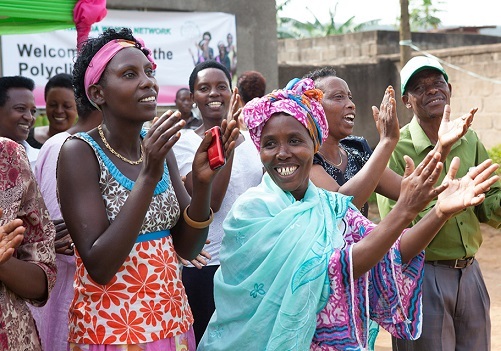 The Stephen Lewis Foundation works with community level organizations which are turning the tide of HIV/AIDS in Africa by providing care and support to women, orphans, grandmothers and people living with HIV/AIDS. Joanna Henry is the director of program communications at the Stephen Lewis Foundation. Ilana Landsberg-Lewis, a labour and human rights lawyer, is co-founder and executive director of the Stephen Lewis Foundation. Alexis MacDonald is the director of external relations at the Stephen Lewis Foundation and a Toronto-based photographer.